Sexual abuse by people in positions of trust has a destructive impact on the lives of many many people. Such abuse is totally unacceptable to the church and to society as a whole. Those who hold positions of trust in the church are called to guard with great care the trust placed in them. They have an absolute responsibility to avoid all forms of sexual harassment and abuse. The LCA Safe Place Committee has established a confidential service for responding to complaints of sexual abuse/harassment by church employees and leaders. Trained advisors are available to help. 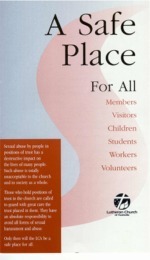 For further information about the LCA's Safe Place policies visit the LCA website.